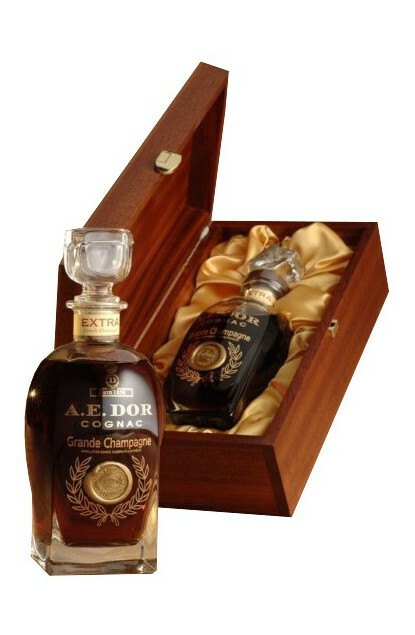 A.E.DOR EXTRA GRANDE CHAMPAGNE is a superb cognac aged during many decades in small oak barrels. A Cognac House created in 1858 by Jean Baptiste DOR, and continued by his son Amédée Edouard DOR, who sought, selected and collected the best Cognacs and Eaux-de-vie. At the time, professionals called him “the cognac antiquarian”. After ageing in oak barrels for decades (70 years and more), some of these venerable Eaux-de-vie from Grande Champagne region, the Cognac Premier Cru, were carefully collected at the maximum peak of their aroma into carboys sealed with wax, in order to preserve them and keep them undisturbed. Today, these glass containers lay in a secret winery called “Paradis”, unchanged since its creation, proudly displaying its prestigious vintages. Flagship of the AE DOR House, they generally predate the well-known phylloxera, that is to say 1874. They kept intact their precious content for more than a century, and warrant the AE DOR House’s international renown.